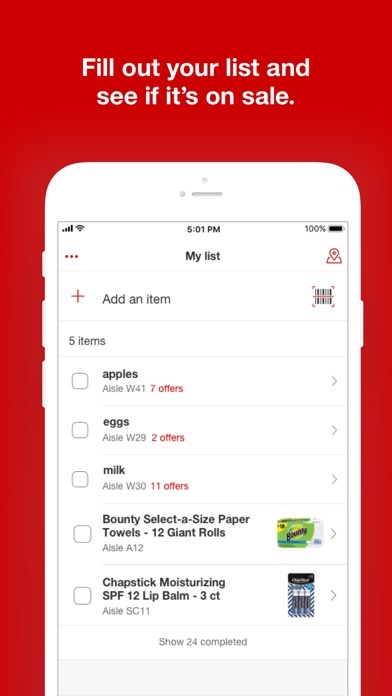 Whether you’re shopping in store or at home, get trip planning, exclusive savings and more with the Target app. Plus, the new Wallet feature is the fastest, easiest way to save and pay in store. 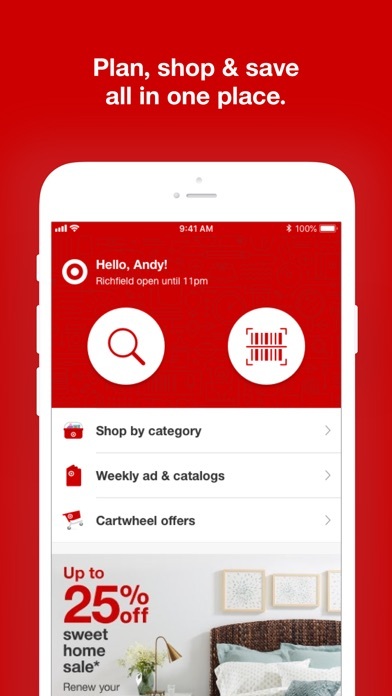 Plan your next Target Run by checking out the Weekly Ad, Cartwheel offers and item availability all in one place. Then streamline your Run with store maps and aisle locations, and scan item barcodes for prices, reviews and available deals. 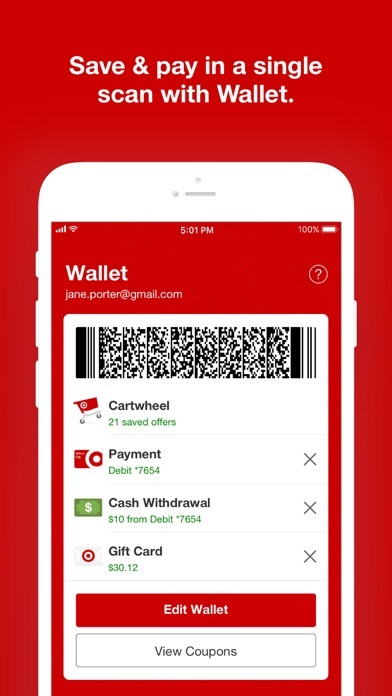 Add your credit or debit REDcard to your Wallet to pay and redeem Cartwheel offers with a single scan at checkout. 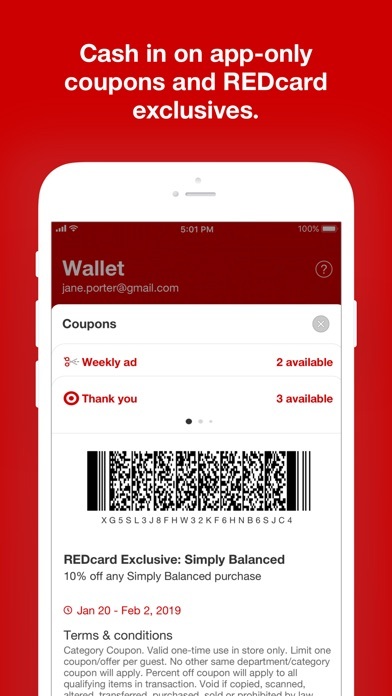 You can also redeem store coupons in Wallet! 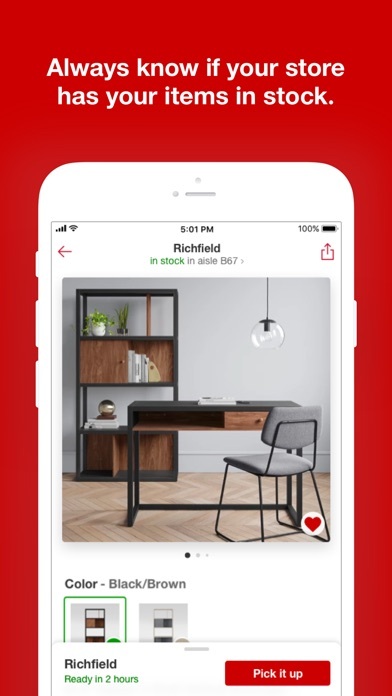 The app also makes it easy to shop from anywhere, allowing you to search our entire selection, complete with online promotions and flexible ordering options. Order quickly and securely every time, then choose to pick it up at your local store or have it delivered to your home. Would love to see a better list feature with categories or multiple lists. 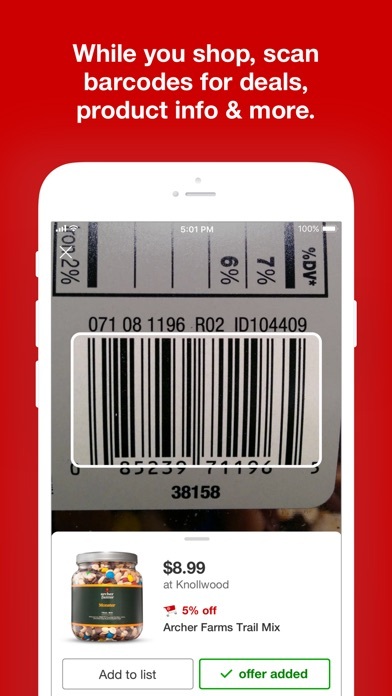 Would also like to see better scrolling through enlarged product pictures - you can only see one at a time now. Tracking of monthly/yearly expenses by category would be awesome. 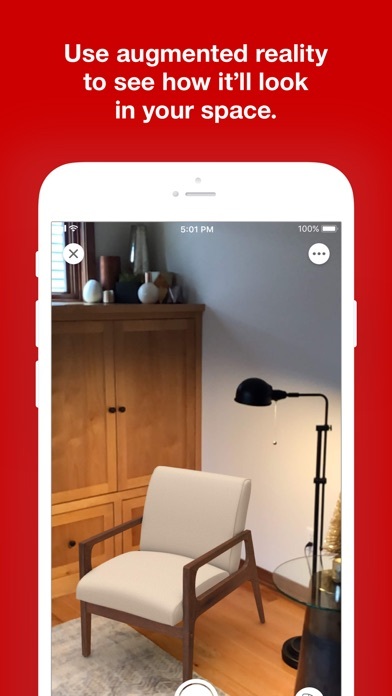 I use this app often and love being able to locate items at specific stores. 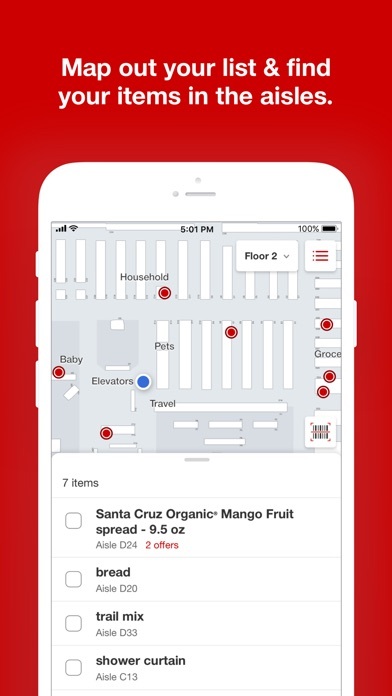 Store pick up is so convenient! Very easy to use! Love the convenience! The app has been “preparing” my order for 15 minutes. I use to love this app at first but now it’s so slow and takes forever for stuff to load. 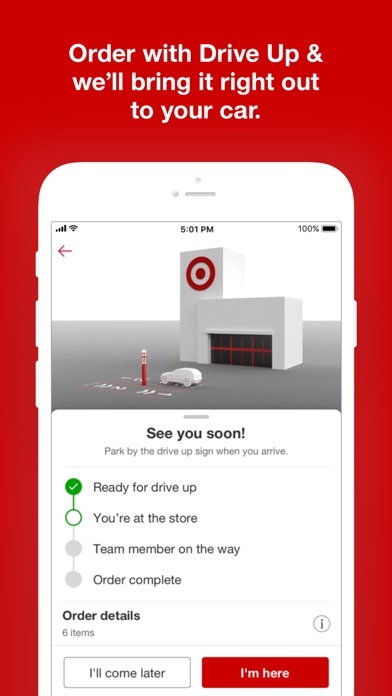 Target if you want to keep up in this day and age of amazon and online shopping you need to fix your app! The app is very convenient and easy to navigate. The reason I gave 3 stars instead of 5 is because of my in store and online order/pickup experiences. On more than one occasion my order was cancelled after weeks and weeks of waiting causing me to have to run to another store last minute to get what I needed. On another occasion 2 items were ordered together and only one was shipped. I was informed the other was coming from another location and would arrive separately. After waiting 2 months I just called to cancel. With my in-store experience, the employees said my items ordered online could not be located and I had to wait for an hour for them to find it. Although I had these issues they were resolved in a professional manner. Overall Target has their flaws but I love Target products. By far the worst app I’ve ever used when it comes to load times. Every product search takes over a minute to load the page, then an additional 1-2 minutes to load product details. Extremely frustrating to use. The app is absolutely horrible for those storing gift cards on the app. You used to be able to go to the gift cards section and swipe between the different ones. There was also a button that would say email my code which was a great security feature. Now they have moved Cartwheel and gift cards to Wallet. You can no longer see the bar codes for the different cards. So yesterday I go to a Target store. I had a merchandise card for $25 which can only be used in store and not added to the app. I also had a gift card stored in the app that had enough to pay the balance. So I scanned my wallet code (with no gift card attached) to get my Cartwheel discount, I then scanned the black merchandise card. I then added a gift card from the app to wallet and scanned it. It wouldn’t take. It screwed everything up. I had to take everything out of the bag and re-scan it again. You really need to make it where you can scan Cartwheel alone then go in and scan the bar code for the gift card. 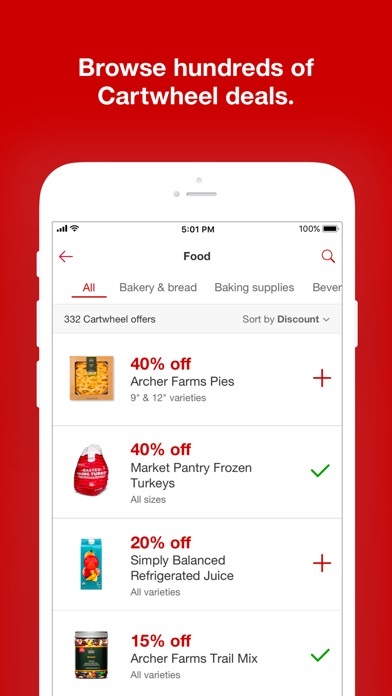 For years we got accustomed to scanning Cartwheel first then gift cards. Now if you do that it screws everything up. You need to remove gift cards from wallet or at least make it where you can do it either way.